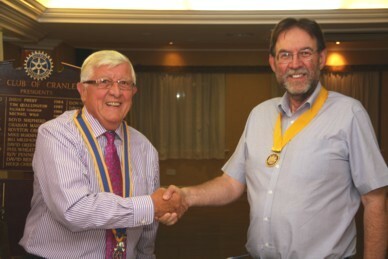 David Hall has taken over from Patrick Leake as the President of the Cranleigh Rotary Club for 2017-2018. The change-over took place at a club meeting on 29 June. David previously served as Club President in 2002-2003. David is Cranleigh born and bred and was educated at the local state schools. He then trained in accountancy with Brewers chartered accountants, and continues to work for them to this day. He is a Fellow of the ACCA. Local baker Tom Cornwell introduced David to Rotary and he was proud to serve as President soon after the new millennium arrived. In that year he led a party of Cranleigh Rotarians to Canada in a very successful visit to various Rotary clubs over there. During the coming year, as President for the second time, David would like to emphasise the fun and fellowship to be had in Rotary, which can be overlooked amongst all the good work done by club members, both locally and internationally. Locally, efforts will mainly be aimed towards assisting schools and youth projects, as well as helping with community projects such as Cranleigh in Bloom. Internationally, the eradication of Polio will continue to receive support as the number of new cases declines dramatically and is now restricted to only a handful of countries. As well as being a keen Rotarian, David is President of Cranleigh Angling Society and a Past President of Cranleigh Chamber of Commerce. Sometimes he also finds time for golf and to help in the garden! Photo caption: Incoming President David Hall (right) with last year's President, Patrick Leake.